With a third album, changes are expected: growth, progression, and refinement. 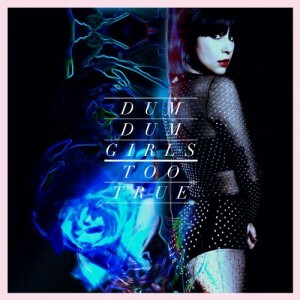 On the Dum Dum Girls latest release, Too True, the changes are not completely surprising. With frontwoman Dee Dee Penny spearheading the campaign, the quartet has fully embraced the dark side of 80s pop: ranging from dream-pop and goth-rock to new-wave and post-punk. The producers Richard Gottehrer and Raveonette Sune Rose Wagner make their presence felt immediately on opener “Cult of Love, ” “Rimbaud Eyes,” and “Little Minx” where the tight production go hand-in-hand with the stark guitar riffs and the reverberated vocals that create a dark environment, while their garage-rock origins linger. “Are You Okay” and “Too True To Be Good” feature catchy hooks and stout melodies that prove pop music can be great if the execution is right. “Lost Boys and Girls Club” churns slowly that makes you feel all warm and fuzzy inside. “In the Wake of You” has the ability to get stuck in your head, especially with that Billy Idol-esque guitar melody. The vintage source material that Too True digs into is deep and identifiable. But it’s their on-point execution and ability to maintain their identity that leaves the Dum Dum Girls sharper than ever.